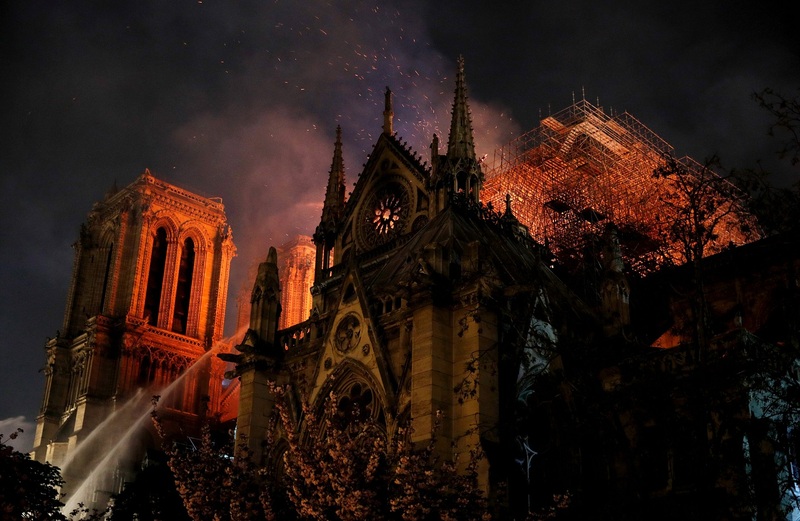 Franç​​ois-Henri Pinault, CEO of French luxury group Kering, which owns brands like Gucci, Yves Saint Laurent and Balenciaga, mentioned on Monday night that he and his family will be donating €100 million (RM467 million) to rebuild the cathedral. Bernard Arnault, the chair of LVMH, doubled that donation on Tuesday morning. LVMH, the world’s largest luxury-goods company, includes brands Louis Vuitton and Christian Dior. A raging fire yesterday evening tore through the revered Gothic cathedral, destroying its delicate spire in front of horrified onlookers and sending its art repository up in flames. The 850-year-old relic, whose name means Our Lady, is the seat of the archbishop of Paris, and home to various artefacts and artworks collected over the centuries. 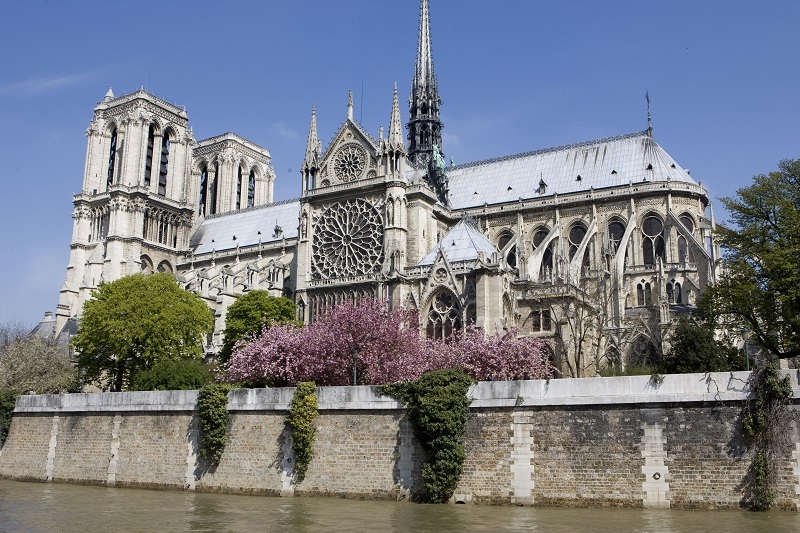 Visited by over 14 million visitors a year, the symbol of beauty has witnessed much of French history, including the coronation of Henry VI as King of France and Napoleon as emperor. President Emmanuel Macron described the fire as a “terrible tragedy” on national TV, with the fire-engulfed still behind him. Emergency services said that most invaluable artefacts are salvaged, including The Crown of Thorns, said to have been worn by Jesus Christ before the crucifixion, and the tunic of St Louis. While the cause of the fire is still under investigation, Parisians and tourists have gathered outside the church, raising their voices in prayer. Macron lamented the destruction of the awe-inspiring building, calling it a place where the French live their greatest moments, “from wars to pandemics to liberations”. Here are five more facts about this feat of architecture that sealed its status as a cultural symbol of France. A geographic marker, embedded in the concrete of the public square just outside of Notre-Dame Cathedral, is the central point from which all roads in France are measured. One of a number of “kilometre zeroes” around the world, the centre of Paris is marked by an octagonal brass plate, sparking a surprising number of local rituals, from spinning in a circle on one foot atop to gain your heart’s desire or kissing a loved one to ensure eternal devotion. There’s a reason the roof of Notre-Dame is called “the Forest”. Containing one of the oldest surviving wood-timbre frames in Paris, the cathedral is supported by wooden beams, each constructed from an individual tree. At least 52 acres of trees were cut down in the 12th century to support the medieval roof structure. (Ed: Reports have claimed that the wooden latticework inside the cathedral had fuelled the fire that consumed the iconic church). Interestingly, the bells of Notre-Dame bear names such as Emmanuel, Gabriel, Marcel, Etienne, Maurice, Jean-Marie, etc. However, the bells we now hear are not the same ones installed upon completion of the cathedral 600 years ago. Like other churches around France, it was transformed in the late 18th century from a Christian space to the new Cult of Reason. All 20 of its bells, except the enormous Emmanuel, were melted down to make cannons. The public remarked that the instruments were not as intricately made as the older versions as they make a dissonant chime but a new ensemble of bells were restored to its 17th-century sound in 2013. The south side of the cathedral is home to a surprising group of residents – bees. On the building’s sacristy, a bee hive was installed in the spring of 2013 as part of a Parisian trend. The Buckfast bees, a strain developed by a monk named Brother Adam – are known for their gentleness. Their honey, made from the flowering plants from the city’s balconies and gardens, were given away to the poor. Twenty eight – that’s the number of statues that were pulled down with ropes and decapitated by a mob. During the Revolution, the people was so disgusted with the monarchy that they took down every symbol of royalty on the streets of Paris. However, the statues that were removed were not of French Kings, but representations of the kings of Judah. It wasn’t until 1977 that the heads of 21 of these kings were discovered during work on the basement of the French Bank of Foreign Trade. They can now be observed in the Musée du Moyen-Âge de Cluny (Middle-Ages Museum of Cluny) on the left bank.